Our last little excursion before Jenny took the kids to Malaysia was a drive to see the Bristol International Balloon Fiesta. I had first heard about this a few years ago and always thought it would be interesting to see. 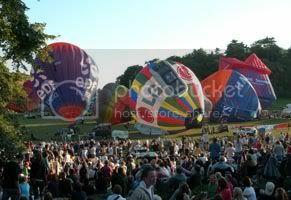 It's Europe's largest simultaneous launch of hot air balloons. Great photo opportunity. Unfortunately, the winds were too strong on the day so the launch was cancelled. And worse, my camera battery died so this is my only balloon picture! There's some more pictures on the fiesta gallery website. What I didn't realise was that the fiesta is also a massive funfair. The kids went on a few rides and insisted on getting fake tatoo's. There was also a parachuting display and a stunt motorcycle display in the main field. Definitely a good day of entertaintment. It was only a two hour trip each way with no major traffic queues. Might try again next year and I'll remember to charge my batteries!